Our rose water comes from the Isparta Region of Turkey. The rose farms from this region do not use pesticides or harmful fertilizers that could corrupt the purity of our rose water. It is sourced from an environmentally-friendly company that is committed to helping local communities in Turkey. From May through June of each year, tons of organic roses are harvested. These fresh petals are then transported to a 100% organic ECOCERT distillation facility. The Rosa Damascena petals are delicately hand picked and steam distilled in a traditional copper still with no added chemicals or preservatives. It is exclusively bottled for ANTHROPOSOPHE in a certified USDA organic sterilized facility in California. THis Rose-based water is full of active ingredients that instantly hydrate the skin. It acts to naturally irrigate the epidermis which distributes moisture deeply into the skin. Our OrGANIC Rose water is rich with anti-oxidants and Vitamins, such as Vitamin A, C, D, E, and B3. It also has natural Anti-Againg, anti-bacterial and anti-inflamatory properties. Toner. After cleansing, simply spray rosewater on your face and you’ll notice that redness will start to go down almost instantly. It is a brilliant skin toner as it HELPS to MAINTAIN THE PH BALANCE OF THE SKIN. it can calm and soothe sunburn and minor skin irritation. It also prepares your face for the application of other products after cleansing. it helps your creams and serums absorb better as their properties keep the skin hydrated and healthy by holding onto the water and LOCKING in moisture. Anti Aging. our rose water not only helps to stimulate circulation in the skin that promotes regeneration, but also helps to prevent thread veins and broken capillaries. IT Keeps your skin moisturized AND HELPS to prevent fine lines and wrinkles. Acne prevention, Purifying skin and Prevents Bacterial Infection. "Rosewater is good for acne- and rosacea-prone patients, because it reduces bacteria on skin, decreases inflammation, and simultaneously hydrates and soothes the skin,” says Jessica Weiser, MD, a dermatologist at the leading edge New York Dermatology Group in New York City. Moisturizing, softening and hydrating effects. Dry skin can experience tremendous benefits from rose water. It will instantly freshen tight, tired skin, naturally hydrating and nourishing it, while adding wonderful radiance and glow. After your regular work out, your skin loses a lot of moisture due to sweating. you can hydrate internally by drinking a lot of water and you can hydrate externally by spraying rose water on your skin. YOU CAN BRING OUR TRAVEL-FRIENDLY BOTTLE IN any place where you might need to freshen your tired, DEHYDRATED skin. Natural Make up Remover. It’s effective AT REMOVING YOUR makeup, yet gentle enough that it will never irritate your skin or hurt your eyes. It won't dry out your skin like other make-up cleansers, allowing you to benefit from the hydrating qualities of rose water as you clean you face. Apply rose water onto a cotton pad and gently massage your face to remove your makeup with it. Makeup Setting Spray and Makeup freshener. Rose water can be applied as a mist to help set your make up. It will provide a healthy glow and a dewy finish. After a few hours, when your makeup begins to look dull, spritz some rosewater on your face to freshen up. Reduce Eye Puffiness and dark circles. It will sooth the delicate skin around your eyes, helping to prevent and reduce eye puffiness and discoloration. 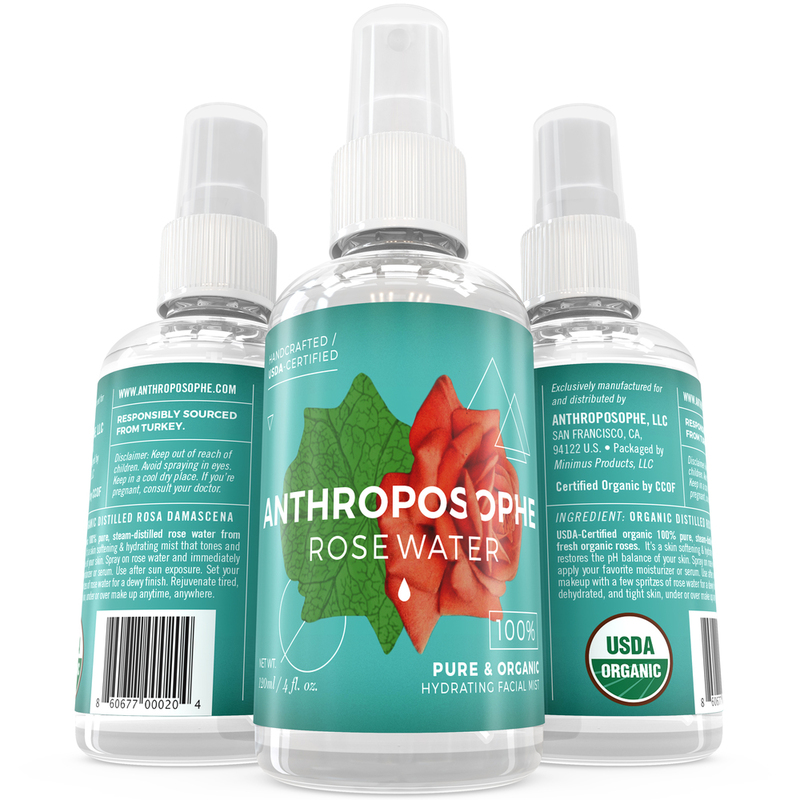 put the bottle of anthroposophe rose water in the fridge for 20 to 30 minutes, and then spray onto a cotton pad before gently applying to your eyes. Aftershave Treatment. "Rosewater’s benefits stem from natural anti-inflammatory properties, which make it ideal for a topical application to calm red, irritated skin conditions,” says Rachel Nazarian, MD, a dermatologist with Schweiger Dermatology in New York City. If you experience irritation after shave sessions, you can apply rose water to your skin after stepping out of the shower, and you’ll begin to feel instant relief. Bath Additives. Rosewater has aromatic calming effects on the mind, in addition to its benefits for skin. Add a cup of rose water to your bath to not only soften and freshen your skin, but also to leave a calming, amazing scent of fresh rose on your body. Aromatherapy. Use rose water as an ingredient for aromatherapy. Research has shown that aromatherapy can have tremendous positive effects in helping fight stress, contributing to more restful sleep, and can even help us maintain a more positive outlook. Perfume. Rose water leaves a light fragrance. synthetic perfumes are not for everyone, and rosewater is the perfect scent for a fragrance minimalist. Spray on the neck and wrists for a light, natural fragrance. Scented Sheets. This is a more natural alternative to synthetic sheet fresheners. Spritz on sheets to refresh between washes. Food. Rose water has been traditionally used as a culinary ingredient in many types of Mediterranean, middle eastern, Russian, and Indian cuisine for hundreds of years. Modernist cuisine takes this very versatile ingredient to add a floral flavor to any dish. Drinks and Cocktails. Rose water has also been traditionally used in teas and lemonades. Now bartenders and mixologists add rose water to various drinks and craft cocktails to give a more complex but subtle floral note to spirits. DISCLAIMER: All information and claims on cosmetics and nutritional supplements on this site has not been evaluated by the U.S. Food and Drug Administration (FDA.) These products are not intended to treat, cure or prevent any disease. Products and information on this site do not warrant, imply or guarantee any result or cure. Please consult your doctor to diagnose and/or treat any disease or disorder. It is very important to read the instructions provided on the label before consuming any of our products.